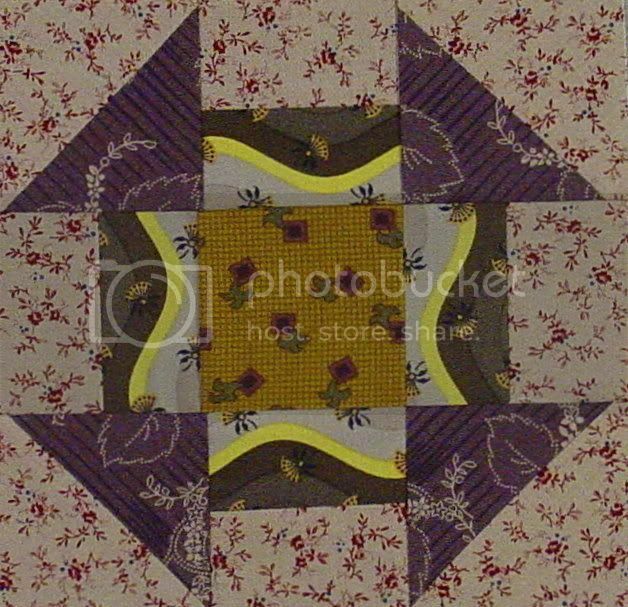 The first one features French General fabrics; the second features that flannel Folk Art Museum fabric by Kathy Hall and enough fussy cutting to make any obsessive-compulsive a happy girl. One day this past week, I rearranged my main sewing room. It is a much better layout and I am delighted with it. Unfortunately, this involved rotating the computer and printers 45 degrees which meant hours of reorganizing the cables. All done now and they mostly don't show, which is a first. I also am now using my 23" TV (a gift from a very generous online blogger friend upon the unfortunate and violent demise of my previous all-but-new computer monitor, which you may remember, perpetrator shall now remain nameless, okay it was Timmy) as not only a TV but also a computer monitor. You just switch the input back and forth. This is all just too cool for words. During the rearranging, Rembrandt became obsessed with a paper clip. Over and over, she would pull it off the folder and knock it to the ground, I would put it back and she would pull it off again. My Rembrandt can do tricks! Here she is merely looking cute and colorful. 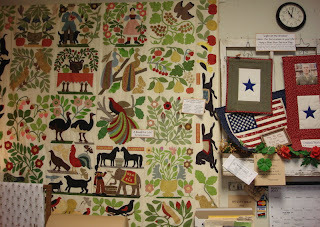 Here is Donna di Natale's new book from Kansas City Star, Anna's Quilt. It is a delightful book that gives the pattern for a quilt that her Aunt Anna made and then smaller projects that are inspired by the Depression Era quilt. Come see it if you can, or be sure to visit it at Spring Market in May in the Kansas City Star booth. I can't make it there myself because of The Troubles, but Donna is going to conduct a Schoolhouse for A Bountiful Life for me, and not only Donna will be there; Mary Ellen von Holt of Little Quilts and Muriel Pfaff, without whom I simply do not know how I would be navigating through The Troubles, will both also be at the Schoolhouse!! I just cannot wait to see the youtube video of Schoolhouse to see my three good friends telling the audience about the book and the quilt. Thank you, Donna, Mary Ellen, and Muriel, dear souls all. Last but not least, I met Bettina Havig at the shop yesterday. I was thrilled! Her book, Amish Kinder Komforts, is one of my favorites. Nothing to report on The Troubles, except that the chemotherapy infusions continue, the side effects are enough to get a hyena depressed, Timmy is helping me in all ways possible and is the best son ever (how many people could make me laugh during the infusion when I know what is coming a few hours later), and it's too early to know what the effect of all of this is. Must think positive. This is the third week, the good week, and I feel fabulous! So as the Easter sunset sets in the west, Rembrandt, Timmy, and I wish you all the best in quilting and daily life. My cat looks a lot like yours, and is obsessed with paper also. I think calico cats are just a little weird that way! I would like to ask you a question about the book Anna's Quilt. Could you email me? I tried to email you but can't get it to work through Blogger, and can't see your email address. I'm sorry you're having to go through chemo, and hope it starts going better. It's great that you have a son that can make you laugh during it! Nice to 'see' you and glad you're sewing a bit. Keep those positive thoughts. I was wondering how you are doing with the treatments. It does not sound one bit fun. Are you still going to work through all of this? Great to hear from you. Thinking good thoughts for you. Gotta love a kitty who can do tricks!!! 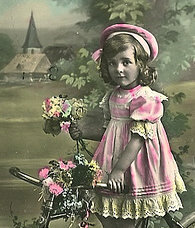 So glad to hear from you on your blog - hope you are beating the crap out of The Troubles. Love your little quilts and your pretty calico - aren't they just the best company?! How nice to have friends help out when necessary. Sounds like you are doing well considering what you are going through. Your Temecula quilts are just lovely. I do wish you well through your treatments and that the last is not far off. So good to see your post - I think of you every day! I am so happy that you got some sewing and organizing therapy in over Easter. Bless Timmy for being such a wonderful son and the dear friends at Little Quilts helping you through this all. I was delighted to see Rembrandt. Remy is into anything and everything still and keeps me laughing at his craziness. My thoughts are with you, dear Karen. What beautiful quilts! You do lovely work. I'm glad you have Rembrandt to keep you in line! We both have wonderful cats! I love your versions of Temecula 12 days of Christmas!! Lovely fabrics! Rembrandt is such a cutie and a great companion it looks like!! 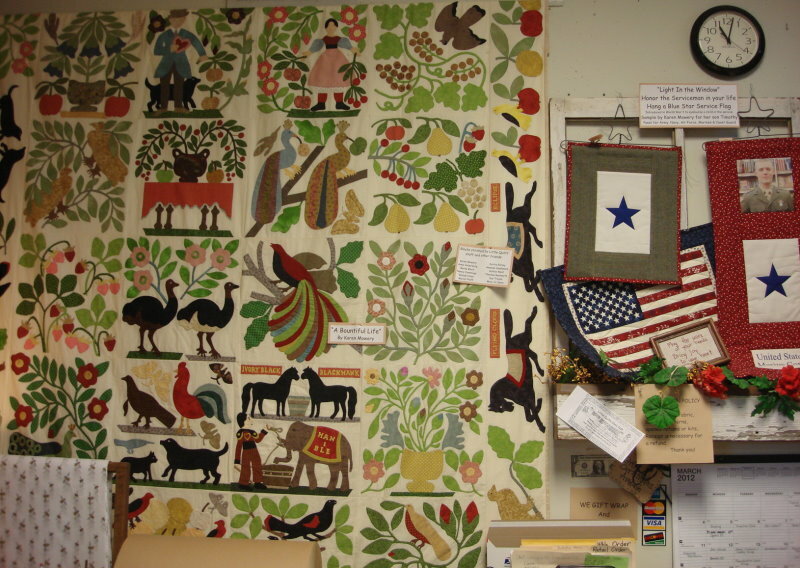 Oh that little folk art flannel quilt is especially darling with your fussy cutting! How wonderful that Donna and the LQ ladies will be teaching about your book at market. Wish I could be there! Wish YOU could be there! Keep fighting the good fight Karen.